This time capsule looks at the relationship the Law Society has had with the Queen's representatives — the Governors General of Canada. So far, three members of the Law Society of Upper Canada have been appointed to the position of Governor General of Canada. Roland Michener was a Toronto lawyer, and later a politician and diplomat, before his Vice-regal appointment in Canada's centennial year. 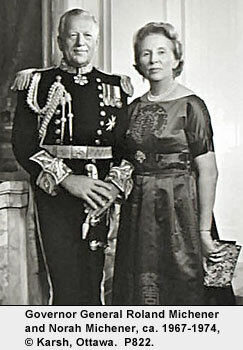 He served as Governor General from 1967 to 1974. Michener was named an Honorary Bencher in Nov. 1968 at a ceremony that took place in the Great Library. Before his more formal speech on the powers of the office, Michener expressed fond memories of working in the Great Library: "Not only is it the storehouse of our learning, but it is the shrine of our profession in this Province." The Law Society awarded Michener an Honorary LL.D. in March 1974, shortly after his term as Governor General ended. Although Ramon Hnatyshyn is best remembered as a Saskatchewan lawyer and politician as well as Governor General of Canada, he was also a member of the Law Society of Upper Canada, having been called to the Bar in Ontario in Sept. 1986. Hnatyshyn was Governor General of Canada from 1990 to 1995, after which he returned to the legal profession, practicing in Ottawa. The Law Society awarded him an Honorary LL.D. in Feb. 1996, a year after the completion of his term. David L. Johnston obtained LL.B degrees from the University of Cambridge in 1965 and from Queen's University in 1966. Prior to his appointment as the 28th Governor General of Canada in 2010, Johnston spent his career in academic positions, including professor of law at Queen's University, the University of Toronto and McGill University, dean of the Faculty of Law at the University of Western Ontario, principal and vice-chancellor of McGill University and president of the University of Waterloo. Still another member of the Law Society held the position briefly. 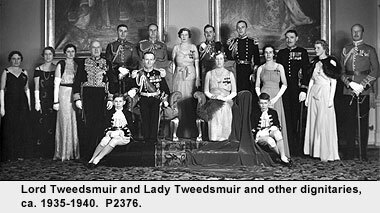 In Feb. 1940 when Governor General Lord Tweedsmuir died suddenly, the Chief Justice of the Supreme Court of Canada became Acting Governor General for four months until Britain appointed a successor near the end of June. Chief Justice Lyman Poore Duff had spent most of his legal career in British Columbia, but he had been born and educated in Ontario, and had been called to the Bar in this province in 1893. Duff thus became not only the first Law Society member to serve as Governor General, but also the first Canadian-born person to serve as Governor General. Vincent Massey became the first Canadian-born person appointed to the position in 1952. The Law Society has hosted visits from additional Governors General. The Marquis of Lorne and his wife the Princess Louise, a daughter of Queen Victoria, visited Osgoode Hall while on an official trip to Toronto in 1879. On that occasion the Benchers voted to illuminate the building in honour of their visit. In Feb. 1936, the Benchers named Governor General John Buchan, Lord Tweedsmuir, an Honorary Bencher of the Law Society. Lord Tweedsmuir, who had been a British lawyer but was better known as the author of such thrillers as The Thirty-Nine Steps , expressed his high regard for the law, for lawyers, and for the British constitution. "Law, I think, should be regarded as an elastic tissue which clothes the growing body. That tissue, that garment, must fit exactly. If it is too tight it will split, and you will have revolution and lawlessness…. If it is too loose it will trip us and impede our movements. Law, therefore, should not be too far behind or too far ahead of the growth of society." All three of Canada's current and most recent Governors General have been awarded Honorary LLDs by the Law Society — His Excellency David Johnston in 1980, Her Excellency Adrienne Clarkson in 2003, and her Excellency Michaëlle Jean in 2012.